January | 2009 | Always On! Who’s the Enemy? Who’s the Friend? Cable operators and TV affiliates complain when programmers put content online. Programmers put content online because that is where viewers are going. Music producers ignored this “where I want it, when I want it” trend, seeking to protect their business model, and were leapfrogged into impending demise by iTunes. NBC Universal cites Hulu as a huge success story, but CEO Jeff Zucker fears that the web will turn “analog dollars” into “digital pennies.” Online ads may garner high CPMs and may be growing at rapid rates, but they are still dwarfed by broadcast. Viacom, owner of MTV Networks, has for years sought to create a “360 degree” media presence that hinges upon the Internet. They now have a huge army of digital employees. Cable operators complain that hits like “The Daily Show” and “The Colbert Report” are available in long form on Hulu. But who is benefiting now? Now I watch Comedy Central more consistently than any other non-premium cable network (I love my Showtime – twisted as it may be), and my loyalty to the two programs above is on par with that for broadcast network programming such as “60 Minutes” – most other programming (“Eli Stone,” “Grey’s Anatomy,” “Ugly Betty”) comes and goes. I am proud and embarrassed to say that I get most of my news from Mr. Stewart and, to some extent, Mr. Colbert. So, what will I do if Viacom goes dark? I don’t envision doing much. First, I don’t watch any of the other MTVN networks. I used to admire Viacom for its segmentation strategy, i.e., different networks for different age demos, but now what that means — for me as a single New Yorker, at least — is that I watch only one of their networks. And, as mentioned above, the two programs I count on are available on Hulu. 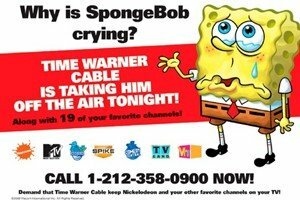 In fact, Time Warner Cable is promoting to its subscribers where they can access Viacom programming online should it go dark on TWC. So, to whose advantage is the online platform now? Ironically, Viacom has made itself less indispensable to TWC – at least in the short term. It reminds me a bit of our strategies in the middle east. We train the enemy of our enemy, even though that force was or could become our direct enemy. A bit of an extreme comparison, perhaps. But the question remains – to whom is the Internet a greater threat and for whom is it a greater advantage? Programmers? Distributors? Both? Neither? Business minds around the world have not yet come up with a way to turn the enormous value of the Internet into a tangible, substantial monetary value. True, digital broadcasts of the Olympics, of SNL (Tina Fey) and of prime time programming do drive stronger TV viewing of these programs — something that was not necessarily anticipated. But, what is the long term business model? How can the television industry identify and transition to a new business paradigm? And, how will they accomplish this in light of existing carriage contracts and – even more specifically — Most Favored Nation (MFN) clauses that make change even more cumbersome? Is Shopping a Sport? Heck, yeah. I have to say I do love sports — but I refer to my own brand of sports – which has little to do with pigskin or cowhide. For example: Shopping. Today’s retail environment is a wonderful climate for shopping. A bittersweet benefit of the recession. In the last month, I have purchased two Missonis from Intermix — as much as 75% off — and four DVFs from her flagship store in the Meat Packing District — 60% off. It’s all about the hunt, the kill, and the trophy. The trophy is the dress, perhaps, but more importantly the tag that says: $795 marked down to $203. But I’m not just a “girly girl,” as a friend who has seen two of the dresses likes to say. I also relish the Samsung flat screen purchased for $880 online – no tax or shipping — vs. the same tv for $1100 at Best Buy. Thank you, CNET! Another form of hunting: Parking spots in NYC. Walking home from watching the fireworks tonight I saw a prime spot on 74th Street between Amsterdam and Columbus Avenues. A huge spot that’s good until 9am on Friday. I was car-less at the time, but I made sure to point it out to an SUV on the prowl down the block. Similarly, parking garages. I recently moved from one that was $233 to one that is $180 — and one subway stop away. (Again, a side benefit of the unfortunate blight of Wall Street.) This is in comparison to the $300-500 monthly cost for something closer to my apartment. A third form of hunting is something I like to call “brand integration spotting.” I may make this a regular blog segment – or set up another site – or perhaps Twitter or Facebook with periodic brand-spots. And I invite you to contribute your own spottings. Example: I saw “The Day the Earth Stood Still” tonight and am SURE that LG paid for some product placement — we had several seconds looking at a phone with a huge LG logo. As did Honda — our fair (and flawlessly made up) heroine was spotted by the armed forces driving a small grey Honda. How trendy! Then of course, there is the manhunt. At any party or social event, it’s fun to see how many shiny pretty fish you can catch even if you end up having to throw them back because they’re too young… or so I’ve heard.